A beautiful rustic Cedar Hot Tub with all the convenience of a modern spa! The Hydroquip electric heat system works automatically to keep your tub ready to use any time. Includes freeze protection for winter use. Tell me more about electric heaters. Top 10 benefits of a Zen Cedar Hot tub - click here. All our hot tubs are made with Western Red Cedar, a beautiful and sweet smelling material that is perfect for hot tubs. We use only premium grade wood(clear - all heartwood). Other woods available on a custom basis. Tub design features our unique industry-leading curved sides and rust-free stainless steel banding. Maintenance on our wood tubs is straight-forward and simple. Electric heated tubs include built-in automatic ozone injection - a proven technology for keeping water safe without the need for high levels of chlorine. Includes 4 jets so you can switch from a quiet soak to a water massage with the touch of a button. Lead time for order to arrive: approximately 4-6 weeks. Our tubs are available in two design shapes: Round or Elliptical. Tell me more about tub shape. 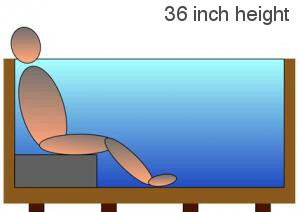 Three choices for height - from left: 29", 36", 42". The graphic below shows these side by side. Note that in each case, you have water up to your shoulders! 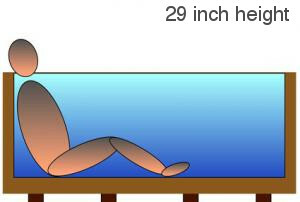 Tubs with less water require less energy to heat. Tell me more about tub height. What's included in the base price? Jets - switch from a quiet soak to water massage with the touch of a button. Benches included with tubs of height 36" or 42"
Bigger Heater: Upgrade from a 5.5 kW to 11 kW heater for a faster heat rate - good for larger tubs or colder conditions. Spare filter: Highly recommended. By having two filters in rotation, your filtration will be more effective and your tub will be cleaner. Underwater multi color light: Add a little bling to your tub! Colors range from white to rainbow colors. Choose one you like or let it cycle. Steps: Three steps made of matching red cedar, make getting in and out of your tub easy. 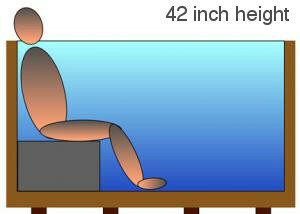 Steps are approximately 24"wide 26"high and 35" total depth, each step being approximately 12" deep. WiFi tub control: Control your tub remotely using a smartphone or tablet! Our tubs and equipment have a limited warranty for a full 2 years against defects in material or workmanship. Covers have a limited 4 year warranty.